This is such a bright and happy card created from the Stampin’ Up! Bloom By Bloom Stamp Set. This is a fun Z-fold card with the front panel held back with the 1/8″ Call Me Clover Grosgrain ribbon. 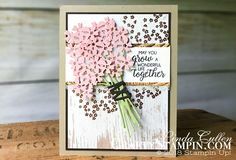 The Dot to Dot Textured Impressions Embossing Folder is used to emboss the Calypso Coral inside panel which is showed-off when the card is closed. 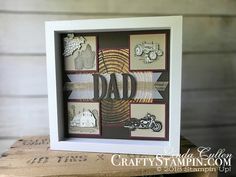 The greeting comes from the Needle & Thread Stamp Set and would make anyone’s day if they received this card.